Paris’s mayor has hit back at US President Donald Trump’s negative remarks about the city, using Walt Disney characters. Anne Hidalgo tweeted a picture of herself with Mickey and Minnie Mouse celebrating the city’s “dynamism and spirit of openness”. At a speech to conservative activists, Mr Trump cited a friend who no longer wanted to take his family to Paris. President Francois Hollande said such criticisms were “never good”. Mr Trump had also criticised Europe’s handling of terrorism, saying that Americans could not let recent attacks happen in the US. More than 230 people have died in a series of attacks in France since the beginning of 2015, including in January and November of that year in Paris and in Nice in July last year. The country has been under a state of emergency for more than a year. Speaking at the Conservative Political Action Conference on Friday, he sought to justify his crackdown on immigration by criticising the effect it had had on some European countries. Media captionFive things we learned about President Trump from his address to conservative activists. He singled out Paris, mentioning a friend called “Jim” who used to be a regular visitor to the city but had stopped going in recent years because “Paris is no longer Paris”. “Take a look at what’s happening to our world, folks, and we have to be smart… We can’t let that happen to us.” Mr Trump went on. Trump says terror attacks ‘under-reported’: Is that true? What was the French response? Ms Hidalgo stressed the inclusivity and energy of Paris, tweeting a picture of her launching a tourism campaign at the Eiffel Tower. The Paris mayor also challenged the suggestion that tourist numbers from the US were in decline, saying reservations were up 30% in 2017. Mr Hollande, meanwhile, said Mr Trump’s remarks were no way to behave towards an ally. 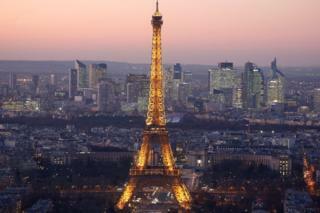 So are tourists really deserting the City of Lights? According to figures published by the Paris Office of Tourism (in French), 7,356,945 foreign tourists arrived at hotels in the city of Paris between January and November 2016, 11.9% fewer than in the same period the previous year. In the same period there was a slight rise in the number of tourists from other parts of France, of 0.3% to almost six million. The 2015 figures mostly cover the period before the 13 November Paris attacks which shocked the country and left 130 people dead and hundreds wounded. How does it compare with New York? According to the New York mayor’s office, the city welcomed 60.3 million visitors in 2016, up by 1.8 million on 2015. This was the “seventh consecutive year of travel and tourism growth for the city”, the statement said. Of these, 47.6 million came from within the US and 12.65 million from abroad. Both figures were all-time highs, the mayor’s office added.